What Day Of The Week Is December 18? 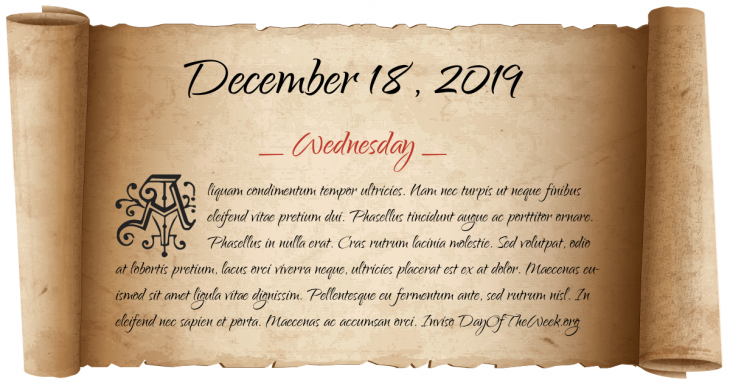 December 18, 2019 is the 352nd day of the year 2019 in the Gregorian calendar. There are 13 days remaining until the end of the year. The day of the week is Wednesday. The United States celebrates its first Thanksgiving, marking the recent victory by the Americans over General John Burgoyne in the Battle of Saratoga in October. The Piltdown Man, later discovered to be a hoax, is announced by Charles Dawson. Who were born on December 18? Sarath Fonseka, former commander of the Sri Lanka Army and a former Chief of Defence of Sri Lanka.